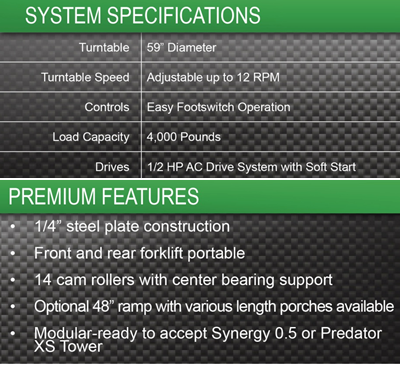 The Predator® UX Low Profile Turntable is the simple addition to aid in stretch wrapping your loads. With variable speeds up to 12 RPM and steel plate construction, the Predator UX Low Profile Turntable is ready for years of reliable operation. Combined with the optional ramp and Highlight Handwrapper, the Predator UX Turntable will save time and reduce fatigue while wrapping. Low Profile Turntable 59” Diameter: Smooth top turntable allowing for easy loading with pallet jacks (when optional ramp is purchased) and fork trucks. 4,000 pound capacity belt drive with sealed for life bearings in a maintenance free design.